To my mind, the Stockton Market, in the sweet river town of Stockton, New Jersey, fits his description perfectly. There’s a certain vibe to this year-round, indoor market. A kinda “Cheers” mentality where vendors, more often than not, know your name—and know what you like. It’s where you share recipes along with family news and new restaurant spots with your favorite vendors—even with other customers as you wait your turn at a stall. And because the vendors specialize in seasonal products, there’s always something new and fresh to learn about and try. One such item that comes to mind is the first time I saw a scallop still in its shell. It was at Metropolitan Seafood & Gourmet’s stall. Its creamy-colored shell held a glistening, large, plump scallop nestled against its bright red/orange roe. Though I’ve cooked scallops many times before, I wasn’t sure how to cook the two together. Mike Drabich, Metropolitan’s head fishmonger at the Market, told me the best way to prepare them. His recipe was easy to make and the scallops and roe were divinely delicious to eat. But, then, so is everything Metropolitan offers, including their in-house made whitefish salad and smoked fish. But I’m getting ahead of myself. Let’s begin with another reason that sets the Stockton Market apart. The Market has Friday hours, albeit with limited vendors. But those who are open with prepared foods make the trip a dining destination. It’s a typical Friday night at the Stockton Market, and the place is humming with shoppers picking up items to make at home or those foods already prepared. But from about 5 o’clock on, the majority have come for a night out to dine with friends and family, including myself, meeting six of my good friends there. For on Fridays, along with its selection of fresh fish and seafood, Metropolitan Seafood rolls out its raw bar, offering $1 oysters (from 3-5 p.m., after that they’re a buck fifty — still a bargain) and six specialty oysters, as well as a changing menu of prepared grilled and fried fish platters, lobster rolls and other specials. 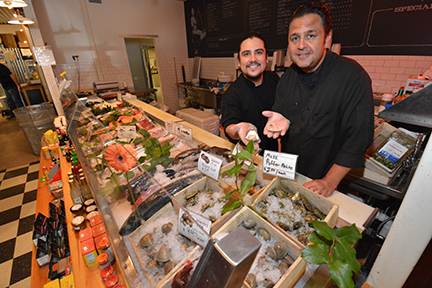 I ask Bryan Schonheiter, tonight’s head oyster monger, his favorite oysters and go from there. For artisan wood-fired pizzas, made with fresh, local ingredients, head to Market Pizza where co-owner Megan Jones-Holt is known as “the pizza witch.” “Customers call me that,” she says, “because I make magic with pizza.” She does that and then some, even offering a “Breakfast Any Time” pizza along with her other creations, such as the Black Forest pizza. It’s made with Italian fontina and mozzarella cheeses, fire-roasted tomatoes and topped with arugula, prosciutto and extra virgin olive oil (and a major hit at our table). Megan uses many of the vendors at the Market, such as Manny’s Meats for his Italian sausage, bacon and prosciutto and Blue Moon Acres or other local farms for produce and eggs. Just be sure to save room for dessert. You don’t want to miss the divine chocolates at Sciascia Confections to end the evening with. (More on them later.) And, oh yes, Friday nights at the Market are BYOB and picnic-style, so bring your own glassware and bottle opener as well. No worries if you forget to bring your favorite beverage. Stockton Fine Wines, a couple doors down, has a great selection of wines and beers. The Cafe can be entered from Bridge Street or from the Market. Stop first at Urbane Tea & Coffee for a freshly brewed cup of La Colombe coffee or one of their botanical-blend teas, then move on to the next stall, Sweet Melissa Patisserie. No need to fly to France for flaky croissants. A French Culinary Institute graduate, Melissa Murphy Rafano, hand makes fresh daily an assortment of croissants, from plain, almond and chocolate-filled to stuffed croissant sandwiches such as bacon/cheddar, roasted cauliflower/ Gruyère and apple/brie. Pies are another of her specialties. As with her croissants, many are season-inspired such as the pear/cranberry, maple pecan and a meringue-infused, classic pumpkin for fall and the holidays. Next is Lenny’s Cocina de Abuelita, where chef/owner Lenny Ojeda and his wife, Leanna, offer Puerto Rican, Cuban and Italian specialties. A favorite with early market-goers is his Breakfast Nonna pressed sandwich, made with delicately fried eggplant cutlets, sautéed broccoli rabe, homemade mozzarella and fried egg. Drop the egg and add a drizzle of his balsamic vinaigrette and you have his popular Della Nonna. Other favorites (including mine) is his Cubano empanada, a take on his popular Cuban pressed pork sandwich—both are nicely flavored with garlic. All sandwiches and empanadas are made to order with fresh and all-natural ingredients. In addition Lenny also makes his own oil and sugar-free tomato sauces, available in jars at the counter. Walk through to the Market and your first vendor is Apple Ridge Farm which bakes an array of artisanal sourdough breads such as a multigrain batard, sesame epi, French country loaf, a garlic asiago and an assortment of foccacia with seasonal toppings. All breads are 100 percent organic, says Dana Hovey, and baked in a wood-fired oven. In addition, Apple Ridge makes savory chicken pot pies, he says. From Apple Ridge I headed to The Kombucha Bar for a quick shot of cleansing and a probiotic drink. Owner and “elixir of immortality” Marie Bogroff whips up a variety of freshly brewed kombacha teas that produce sparkling probiotic beverages to promote good health. Marie also makes three wheatgrass drinks (sold by the shot or bottle): an anti-inflammatory and two cleansers, which, she says, depending on which you choose, can clean your blood and give a boost to your day or protect your liver. Hard to argue with that. Award-winning Sciascia Confections is always a must-stop, whether indulging your inner chocolate cravings or as a delectable treat for friends and family or a hostess gift, chocolatier extraordinaire Tom Sciascia has what you need. From artisanal chocolate truffles to French-rivaling chocolate macarons and salted caramels, all are made with 100 percent farmer-owned organic chocolate, all natural and locally-sourced ingredients. Some of his other popular confections include his gluten-free BFF cookie and Dark Chocolate Bark, an addictive creation of dark chocolate, roasted almonds, hazelnuts, pecans, tart dried cherries and fresh candied orange peels. (Disclaimer: I’ve been a proud member of Tom’s Bark Club for years.) For the fall, look also for his incredible cocoa powder—a must for hot chocolate lovers. For produce, veggies and fruits, turn to Blue Moon Acres. Its seasonal display of vegetables and fruits is a virtual garden bouquet of goodness. Blue Moon also grows New Jersey’s only rice crop, growing a variety of rices on their Pennington farm. In addition to their own produce and products, they carry other local products such Solebury Farm Applesauce and Eat This! produced foods. At Highland Gourmet, Ben Avila offers his own 100 percent natural-grass fed Highland ground beef and steaks as well as local honey, assorted cheeses and homemade pies and chicken meatballs made by his wife Denise. In between Highland Gourmet and the Cottage Spice Company, you’ll find Mushrooms ETC. where Stephanie McCue reigns fungi queen. On any given weekend, Stephanie has a gorgeous array of fresh and seasonal mushrooms, such as golden enoki, royal trumpets, shiitake, black trumpets, hen-of-the woods and crimini. Along with the mushrooms, Stephanie also offers French feta cheese and tasty homemade tapenades and a Mediterranean olive marinated mix with rosemary and orange peel. There’s also a mushroom quiche baked fresh by Denise Avila and sold by the slice. Nearby is Mediterranean Delicacies, which offers organic Tunisian olive oils from their family’s olive groves, spices and olive tapenades, as well as native wooden spoons, bowls and pottery bowls. Family member Zaneb Bensalem welcomes tasters to try their olive oils and taste the difference. For South of the Border specialties no passport is necessary at El Mariachi where you’ll find exceptional traditional Mexican fare such as tacos, fajitas, tamales and burritos. Just make sure to include sides of their authentic guacamole and salsas. Nearby is Manny’s All Natural Meat. If you’ve been looking for an old-time butcher, look no more. Manny Pollari is the real deal. He comes from a family of butchers, beginning with his grandfather at his own butcher shop in Brooklyn. Not only does Manny offer freshly cut steaks and ground beef but also fresh duck breasts as well as those fully cooked, organic chicken and his own nitrate-free, double-smoked bacon and Italian sausages. Before leaving, make sure to add several of his arancini balls—the irresistible Sicilian stuffed rice balls which Manny makes from his grandmother’s recipe (and which were celebrated in the May 1983 issue of National Geographicmagazine). Along with the mix of artisan food vendors, you’ll often find Whim Jewelry, timeless jewelry crafted by Meredith Cole. There is no right or wrong way of navigating the Stockton Market. To be sure, you’ll have weekly favorites, but I encourage you to stop at least once to all. You may find yourself, as I have, adding to your list of must-stop stalls. In addition Cheryl Olsten, who with her husband Steven Grabowski owns the Market, says, “The Market hosts guest artisan vendors throughout the year, including local cookbook and health book author demonstrations and book-signings.” Come holiday time, look for local crafters as well in time to find that perfect holiday gift, she says. Guest musicians also appear monthly. Check the Stockton Market Facebook or chalk board next to Metropolitan Seafood for the latest list of events. The Stockton Market is located at 19 Bridge Street in Stockton, N J; 609-608-2824; www.stocktonmarket.com. Hours are Fri. 12 pm – 8 p.m. (limited vendors; check times for each); Sat. 9 a.m. – 4 p.m. and Sun, 10 a.m. – 4 p.m. Market Café hours are Sat. & Sun. 8:30 a.m. – 4 p.m.
next post: NJ.com: Sweet Melissa’s Patisserie Wins N.J.’s Best Bakery!